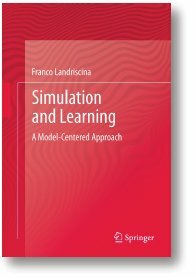 Simulation and Learning. A Model-Centered Approach. which has been recently published by Springer (New York). The book has a foreword written by Professor Norbert M. Seel, one of the leading authorities in the the sciences of learning. You can read it here. And here you can preview the book’s table of contents. If you want to buy it on Amazon, click here. If you like the book, you might review it!